OnGuard Pest Control offers highly effective woodworm treatment in Dublin and neighboring counties. Unlike many other pest control companies that just use surface sprays, we we can also offer one of the best high pressure woodworm treatment systems currently available on the market . Although not all cases of woodworm problem require high pressure woodworm treatment, this kind of treatment is really important where there is a strong possibility of woodworm infesting your roof beams. If this is the case, the treatment fluid needs to penetrate as deep as possible to kill the insects and prevent further structural damage to your home. Spraying the surface unfortunately will not suffice. If you have woodworm in furniture, especially antique furniture, you may need to apply additional, more specialised woodworm treatment. Woodworm is the general term given to the infestation of timber and wooden items by wood-boring insects. Wood worm isn’t actually a worm – in fact, they are insects and their larvae that bore into wood, causing damage to furniture, floors and a building’s structure. Wood worm refers to the larvae of any wood-boring beetle, rather than one particular species. In Ireland, the most common woodworms are the Common Furniture Beetle (Anobium punctatum), but Deathwatch Beetle (Xestobium rufuvillosum), House Longhorn Beetle (Hylotrupes bajulus) and Powderpost Beetle (Lyctus brunneus) may also be present. Woodworm is often found in household attics, eating away at your roof beams. An unchecked woodworm infestation can result in weakening of timbers and the whole structure of your house . The Common Furniture beetle, the most common wood worm, likes damp wood and plywood. You’ll find it in damp floorboards, old furniture and loft rafters. How can I tell that my house has woodworm problem? 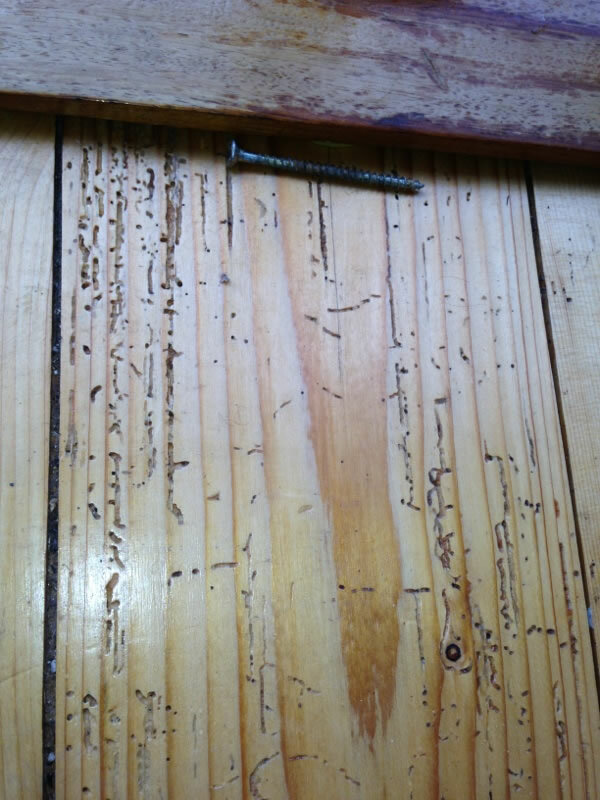 Signs of woodworm infestation are holes in floorboards, timber beams, windows, door frames etc. A white or yellowish powder can often be found around these holes. 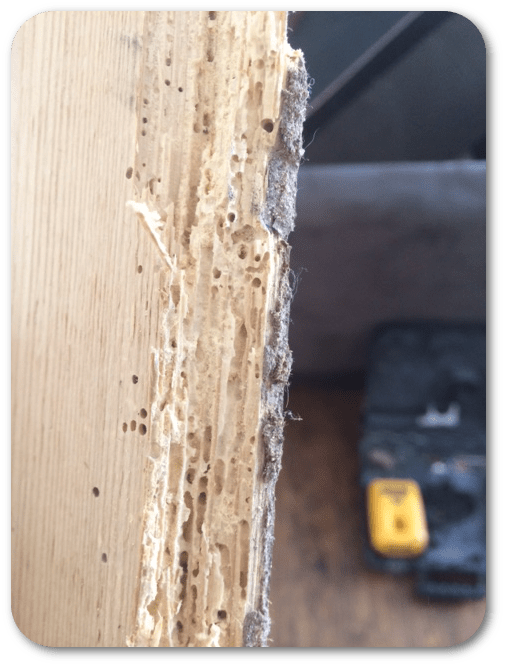 You’re unlikely to see a wood boring insect – and certainly not the worm-like larvae – in your home, but you can certainly see the results – tiny holes in timber caused by the boring as the adult beetles emerge from the wood. Wood worm is often brought into the home unwittingly in second hand furniture or reclaimed timber. However, the beetles can also fly into the house from outside. Professional Woodworm Treatment – What Is Involved? There are a number of species of woodworm beetles and the precise method of treatment will depend on which species is attacking the timber. Woodworm can be treated using a chemical insecticide which will be applied to the affected area to prevent further infestations. However, applying the treatment requires a lot of preparatory work. All timbers must be cleaned down first and any roof insulation material will have to be removed temporarily so that you can get at the joists to work on them. Also this avoids the fire-risk of insulation becoming impregnated with the fluid or small polystyrene granules dissolving together. You need to cover electric cables and the cold water storage tank. Floorboards must be lifted to get at the undersides and the joists. Depending on the situation, your furniture may also have to be dismantled and treated. Not all wood worm needs specialised, high-pressure treatment, however some types of wood worm burrow deep, so they can cause extensive damage and require more than just surface spray. In those cases, to treat the wood effectively and prevent the problem from re-occurring, you need professional equipment which can inject the treatment deep into the timber. Do you need Insulation also? We can install insulation on the same day as we treat for your woodworm. Depending on the type of infestation, we offer surface spray or high pressure treatment that penetrated deep into the wood. We treat floors, doors, door frames, beams, window frames and furniture – no stone remains unturned. We also offer advice on specialised treatment for your antique furniture, as not all wood worm products are safe, some may stain your wood finish (see our article on woodworm treatment in antique furniture) . 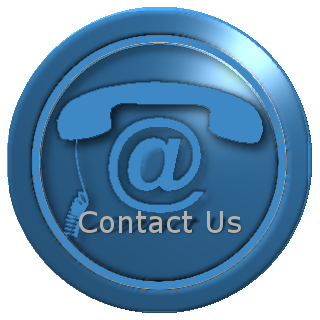 For a FREE quotation and advice – call us 01-4511795.